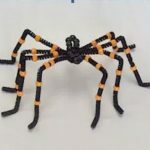 This fun and easy Pipe Cleaner Spider was designed by 3 year old Cassie of Smithtown, New York. We love it when our young contributors come up with fun crafting projects. Cover the styrofoam ball with tissue paper in a color of your choice. 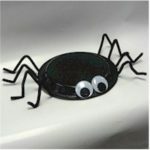 Insert one end of each pipe cleaner into the ball where spider legs would be. Bend to make legs. (see picture).